I'm going to be the one millionth blogger to write about this, but I have opinions and that's the point of this blog. I'm not going to pull any punches here: I find this graphic disgusting. Why? Because for one thing, we're once again pitting women against women. Don't we have enough problems? Don't we have plenty of issues in our lives as women that we don't need to sit here and tear each other down? Talk about playing into other people's hands, we're dividing and conquering all on our own. Listen, I wholeheartedly understand and support the sentiment behind this. I think that science-fiction provides more positive female role models than most other genres and especially more than pop culture does. Because characters in sci-fi tend to be more fleshed out and more three dimensional than we allow our celebrities to be. 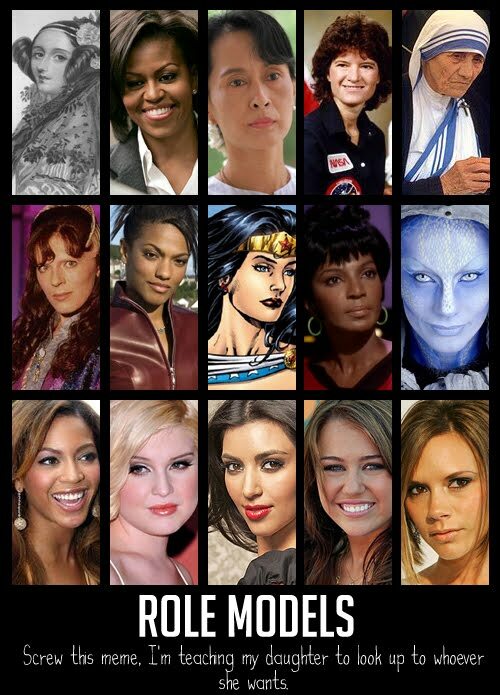 All the women on the bottom row are ones that I find inspiring and awesome, there is no doubt in my mind there. Yes, you should buy your daughter a ray gun if she wants a ray gun and introduce her to all these great shows, they're all shows that made my world better. But let's talk about something else: Geek culture is as steeped in sexism as pop culture is, and often in a much more disgusting way because it pretends that it's not sexist. This meme still shows how even in sci-fi we're creating a box that women have to fit in in order to be deemed acceptable. Look at the choices being represented. From Farscape, you have Aeryn Sun, the soldier with a very big gun. She's the fighter. And that's great, but why did they choose her instead of Zhaan or Chiana? Because Zhaan was more spiritual? Because Chiana walked around in low cut outfits and slept with multiple people? Firefly had three main women, Zoe (pictured in the meme) is again, the soldier. What's so wrong with Inara? Could it be that she's feminine and a prostitute? What about Kaylee, who is amazing with machinery and engines, but also more than comfortable with her own sexuality? Yes, Zoe is comfortable with her sexuality, but she's shown as a devoted wife. Her sexuality is contained within a marriage, Inara and Kaylee are happy to sleep with men they aren't emotionally attached to and that's a big difference. Babylon 5 is probably the show on this list that has the best female characters, but they again pick Ivanova, the soldier. Delenn frequently stands up to entire armies of starships and tried to sacrifice her own life to stop a civil war on her planet. But she's also of the religious caste and spends more time meditating and being spiritual than fighting (though she'll fight when she has to). Jadzie Dax represents Star Trek, because we can't admit that Troi is more than a tight suit and talking about our feelings. Uhura has a short skirt and that's not okay. And it's worth noting that Dax actually isn't exactly female either. The host to her symbiote is female, but the host has been male in the past. I didn't watch Deep Space 9 so somebody more versed in it than me can pull it apart. Then we have Samantha Carter, another soldier. The bonus to Carter is that she's also a scientist, so she can fight but she's also a genius and a leader. But is there something wrong with Dr. Frasier? Or Vala? Or even Dr. Weir? Listen, I get why these women were chosen, for the most part they're the most visible and accepted female character of their particular franchise. But think about that: WHY are they the most accepted and celebrated? Could it be because they're still in traditionally masculine roles and have masculine characteristics? More than likely that's your answer right there. We're still saying women are their most valuable when they're acting like men. When they're fighting, when they're running around with big guns. I'm not planning on having kids, but I would only buy my theoretical daughter a ray gun if she wanted a ray gun. If she wanted to become a fashion designer, then I'd let her do that. If she was quieter and more spiritual, I'd encourage that. If she wanted to wear pants or dresses, either is okay. Pink or purple or blue or green are all fine choices for favorite colors. Stop telling women their personal choices aren't okay. End of story. I can identify all the women in the top row. I don't recognize any of the people in the bottom two rows.